EMR Buffet-5 Free Electronic Medical Records That Physicians Should Look into. Who said that “there’s no such thing as a free lunch”? In most cases, it is true, but believe me, there are still a lot of good stuff out there that we can get for free. Case in point are Electronic Medical Record applications. Believe it or not, there are free EMR solutions available for those who needs it. As we all know, In these times of economic uncertainty, we all need to minimize our expenses to stay afloat. Avoiding payments to our friendly neighborhood EMR vendor can be a brilliant idea. There are several Open Source EMR solutions available. When I say “open source” it means that it was or presently being developed by a community of people who share a common interest or agenda. Wikipedia defines Open Source as a software whose source code is published and made available to the public, enabling anyone to copy, modify and redistribute the source code without paying royalties or fees. Open source code evolves through community cooperation. These communities are composed of individual programmers as well as very large companies. 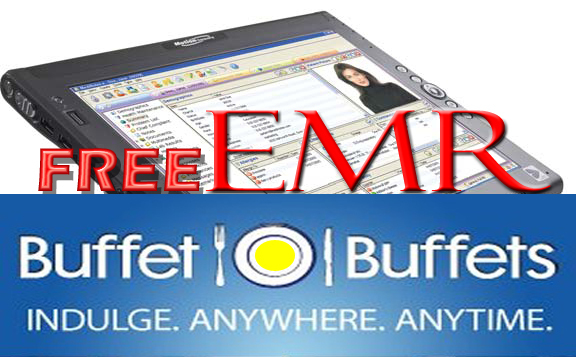 There are, however, things that you need to consider before you indulge yourself into this free EMR buffet. These are maturity, level of available support and the currency of development. When I say Maturity, it means that the application should be around for a considerable time. Try to avoid new applications as it is not proven and polished yet. It may contain bugs and of course, trouble. It is also important to determine the level of user’s activity around the said application. An active user’s forum or an actual technical support service is a positive sign. And Last but not the least, currency of development. When was the last update released? If the latest version was dated three years ago and no sign of any upcoming upgrade is on the horizon, don’t even attempt to click that download button. A good EMR application should be in active and continuous development. Freemed is an open source, web-based electronic medical records. It includes basic EMR functionalities like scheduling, patient management and billing system. It has a modular architecture that allows adding and removing of modules without the need to reprogram its core interface. It is highly customizable to fit the unique and intricate needs of its users. Freemed is HIPAA compliant and conforms to the HL7 standards specification. Its development started in 1999.It has a vibrant community of users and is currently being developed. PatientOS- is another open source electronic medical records system. Its design and framework was built to support an enterprise-wide health information system. It is saleable to fit the needs of its user big and small. PatientOS can be deployed in a big hospital environment but it can also be tailored for use in small clinic setting. It is a comprehensive healthcare information system which includes scheduling, orders , medication and pharmacy management, billing component and more. It also complies with HL7 standards for seamless integration with other information systems. OpenMRS- is a community-developed, open source, enterprise-grade electronic medical record system platform. It was originally created as a medical records system for developing countries ravaged by diseases such as HIV, Tuberculosis, etc. OpenMRS was introduced in 2004 by a multi-institution collaborative initiative led by Regenstrief Institute, a world-renowned leader in medical informatics research, and Partners in Health, a Boston-based philanthropic organization with a focus on improving the lives of underprivileged people worldwide through health care service and advocacy. According to its developer, “OpenMRS’ strength lies in its use of conceptual database structure which is not dependent on the actual type of data to be collected on particular form which allows effective customization”. It has an endless list of features that might require a whole blog post of its own so just check the site yourself. OscarMcMaster- OSCAR is a Free Open Source Software product licensed under the GNU General Public License. It includes complete scheduling, e-charting, prescribing and billing functions, Lab downloads, tables and disease Registry, Automated customizable forms and other related features. OpenEMR- OpenEMR is an ONC “Meaningful Use” certified electronic health records and medical practice management application. It features fully integrated electronic health, records, practice management, scheduling, and electronic billing. It was initially released in 2001. It underwent numerous enhancements through the years. It is one of the most popular and actively developed open-source EMR around. Whew! That was a long post! Looks like each one has its own strength and weaknesses. Now, its your turn to check them out and let me know bout your thoughts. Don’t forget to drop me a comment later. ← Are they Really Killing Us Slowly (With their Drugs)?